Papercraft del Erizo de Sudáfrica - Manualidades a Raudales. Erizo de Sudáfrica recortable y armable. Papercraft recortable del Erizo de Sudáfrica, podéis descargar una amplia colección de manualidades recortables de animales de todo el Mundo haciendo click Aquí, esperamos que os gusten. Y completéis vuestra propia colección. También podéis seguirnos haciendo click en el Me Gusta de nuestra página de Facebook. Erizo de Sudáfrica / South African Hedgehog. 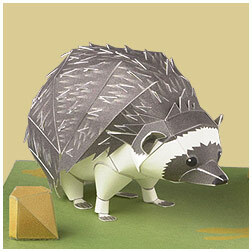 Papercraft de un Erizo de Sudáfrica / South African Hedgehog. El erizo de sudáfrica (Atelerix frontalis) es una especie de mamífero erinaceomorfo de la familia Erinaceidae. Es un erizo originario de los países de Angola, Botsuana, Lesoto, Malaui, Namibia, Sudáfrica, Zambia y Zimbabue. Pesa entre 260 y 600 gramos y tiene cinco dedos en cada pata. Sus púas son blancas con bandas marrones. El hocico es de color marrón oscuro y tiene una franja blanca en la frente. Fuente: Wikipedia y http://global.yamaha-motor.com/. The Southern African Hedgehog (Atelerix frontalis) is a species of mammal in the Ericnaceidae family. It is found in Angola, Lesotho, Namibia, South Africa, Botswana and Zimbabwe. Their bodies are covered by sharp spines. The average mass of a fully grown male is 350g. The main color is brown but there are other colors too. Their protective mechanism is to curl into a ball when threatened. This, however, is not always enough defence against the powerful claws and hard feet of predatory birds, such as owls. The Southern African Hedgehog is insectivorous, with a wild specimen’s diet consisting mainly of earthworms and crickets. However, the South African Hedgehog has evolved to become mostly omnivorous due to habitat loss and trash from human civilization being readily available. Wikipedia and http://global.yamaha-motor.com/.